Use these books to introduce and/or reinforce money skills. The stories in these books provide real-life connections for students and motivate them to master money skills so they do not encounter the problems the characters face in these books. Book discussions and activities should focus on increasing student proficiency with money exchanges, making change and making sound fiscal decisions. Links to several online activities are included to get your creative juices flowing as you craft connections and follow-up activities for your students. See Money Activities & Strategies for additional suggestions on teaching money concepts and skills. 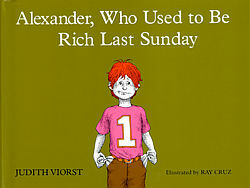 Alexander, Who Used to Be Rich Last Sunday by Judith Viorst, chronicles Alexander's expenditures and the decisions he makes as he spends the dollar his grandparents gave him. Check the Smart Book's Lesson Plan for a twist in the story that invites older students to investigate probability to solve Alexander's problems with money. Read third graders' original money stories based on the Alexander book. 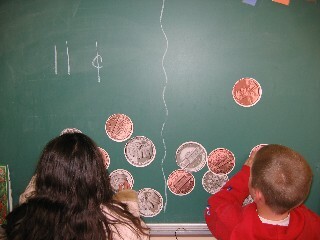 Then challenge your own students to create their own money adventures. The poem Smart, written by Shel Silverstein in Where the Sidewalk Ends, is a good-humored look at our money system and a child's misunderstandings about the size and value of coins. This is especially effective when student's "act out" the poem using the large coin cutouts or when students draw their own coin illustrations for the poem. See a Lesson Plan for Smart: How Smart Are You with Money? Download My Coins Go Jingle Jangle, a sample glyph activity from Great Glyphs Around the Year by Honi Bamberger & Patricia Hughes. The Go Around Dollar by Barbara Adams introduces students to important facts about a dollar bill: the symbols on the bill, the ink, paper, printing, etc. Print out One Dollar Bill for students to examine and color. This site offers both front and back views of the dollar bill. Read Scholastic.com's article about the new $10 bill and how it was designed to discourage counterfeiters. Visit the U.S. Mint for Kids for more information on coins and currency. Creative writing: encourage students to write their own Go Around Dollar stories. Nathan Zimelman takes a humorous look at a second grade fund raising project and the many adventures and misadventures along the way. Create opportunities for the class to raise and save money for a class project (e.g. donate to worthy cause) and use math skills to graph progress toward the goal and to make projections about how long it will take to meet that goal, etc. Enchanted Learning's Statue of Liberty entry includes measurements, a printout and a quiz. 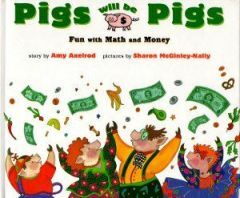 In this book, Amy Axelrod tells how the hungry pig family finds an empty refrigerator and then decide to hunt all over the house for money. After finding different amounts of money, they drive to their favorite restaurant, Enchanted Enchilada, and order 4 daily specials from the menu. As you read the book, have students add the found money to the shoebox or keeping a running tab of coins found in a frequency chart. How much money did the Pigs find altogether? How much did their dinner at Enchanted Enchilada cost? How much money do they have left after they pay the bill? NCTM's Illuminations Lesson on Making Change teaches students how to count on from the price to make change. Pigs Will Be Pigs: Fun with Math challenges students to use local grocery ads to buy a balanced meal that costs no more than the money the pigs found. Students create a paper plate collage of the balanced meal. Math Center: Post the Enchanted Enchilada menu, give students "wallets" with different amounts of money and let students order and total their purchases. In this book, Caren Holtzman [Hello Math Reader, Level 3] recounts in verse how a young boy spends the quarter he got from the Tooth Fairy for his tooth. He first buys a monster for his quarter but then decides it wasn't quite right and returns it, getting 2 dimes and 1 nickel back. Each time he buys and returns an item, he gets his 25 cents back in a different combination of coins, making this book an excellent introduction to the problem of how many different ways students can make 25 cents. Challenge: What other ways could the character have gotten his 25 cents in change? Try to find all of the different ways. How did you organize your answer to be sure you had found all of the ways? Download How Many Different Ways Can You Make 25 Cents? student worksheet and answer key. Writing Extension: Each student writes additional pages for the story that describe what the character buys and what combination of coins he gets back when he ultimately returns the item. 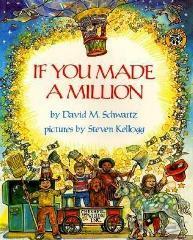 David M. Schwartz begins with a penny, a nickel, a dime, a quarter and works up to the million dollars. Along the way, Schwartz describes what students could buy with the different amounts of money, how many different coins it would take, how much the coins would weigh, how tall the stack of bills would be, etc. to help students appreciate the larger amounts of money. Challenge: If you laid a million pennies in a line, how far would the line reach? Use words, pictures and numbers to describe how you found the answer. Download the Million Pennies problem. 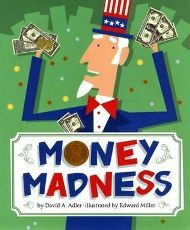 This book, by David S. Adler, is a great introduction to a money unit. "It's hard to imagine a world without money," Adler says. He then delivers a mini-economics lesson taking readers from a life without money to today's credit cards and digital money. Along the way, students learn about trading and bartering as well as the natural progression from metal coins to paper money to the credit cards and digital money that are widely used in today's world. It's a quick read that provides a simple introduction to the history of money and its importance.